As you know, we have been reviewing national Genetic Counselling certification/registration programs outside Europe. We would like to thank you for all your support providing all the information about your certification process. After a carefully assessment by the Genetic Counsellor Professional Branch Board of the EBMG, we are pleased to inform you that the requirements for registration as a genetic counsellor in Europe are covered by your system of genetic counsellor certification/registration. 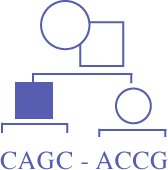 This means that if CAGC certified genetic counsellors have been practising for at least two years (in Europe for at least 1 year) and wish to apply for European registration, they can do so under the existing ´national registration’ clause. They will need to submit proof of certification, current employment details and references. This information will be posted on the EMBG website, and please feel free to publicise this among your members.